I've been chasing a very intermittent problem since upgrading a stable 9.2 system to 11.1 (and beyond) about a year ago. The real problem is it often takes a week or more to act up so I've been trying things here and there and crossing my fingers. I've finally decided to just ask for help after today I found it rebooted yesterday at 8:58am. The bottom line is it acts like there is a memory leak somewhere. Over time the ARC fills normally and RAM useage holds at a nominal value. In as little as two days or as long as three weeks, all of a sudden RAM usage jumps to near 100% and spills into the swap. Once this happens it's a matter of hours (or perhaps a day or so) before it crashes. Once or twice I got a kernal panic (a page fault), but more often then not it just spontaneously reboots. Once restarted it repeats again, and again, and again, and... From what I can tell the crash corresponds with disk access, most often either snapshots executed via cron (as was the case yesterday) or at the start of an rsync backup from other machines. Oct 17 08:58:20 marvin kernel: Copyright (c) 1992-2018 The FreeBSD Project. Oct 17 08:58:20 marvin kernel: The Regents of the University of California. All rights reserved. Oct 17 08:58:20 marvin kernel: FreeBSD is a registered trademark of The FreeBSD Foundation. Before I knew how to preserve logs I took a pic of a kernal panic, this one from 7/8/2018. 10 HDDs and 2 SSDs, all ZFS pools (no L2ARC, etc). vfs.zfs.arc_max is set to 22GB at present. Lower values do seem to delay the problem, but don't eliminate it. As you can probably tell from top, I do have one BHyve VM plus a few jails (via TheBrig). 48GB swap in a ZVOL on the SSD (move swap to a large fast volume was one of the things I tried). Last edited by texneus on 14 Feb 2019 06:28, edited 1 time in total. Just FYI, I am seeing a similar issue here, on similar hardware. You can disable ARC compression and see if it makes a difference. ARC compression caused panics on my NAS box in the beginning. ARC compression can be disabled in sysctl.conf by adding vfs.zfs.compressed_arc_enabled with a value of 0. Your top report shows only 958M free, my suggestion is to limit ARC Max to 4GB-6GB and start monitoring memory consumption over a month. ARC Max is set by adding vfs.zfs.arc_max to loader.conf (earliest possible stage), a reboot is required. I assume you don't have L2ARC devices installed. Thanks ms49434, I'm going to try that. 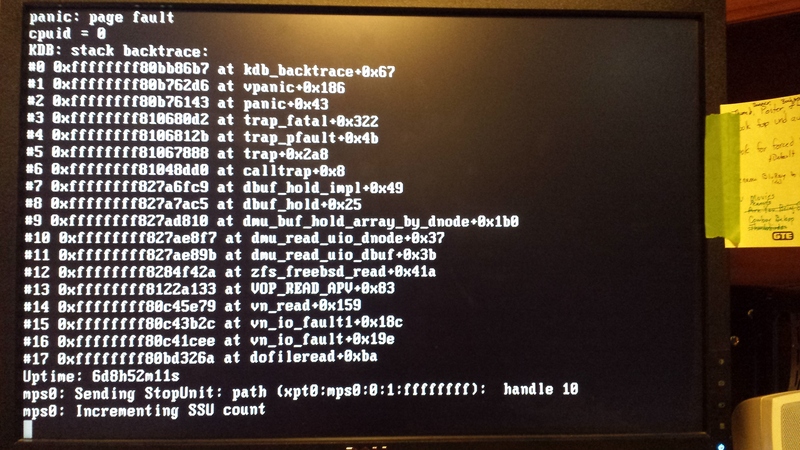 Plus random I/O errors, please first steep to do is to run memtest86+, if pass then the rest troubleshooting as usual. Note that not only RAM may be the cause, on legacy and/or old hardware a bad Memory/MCH/Bridge controller may cause unexpected behaviors harder to debug/troubleshoot but at least you get the idea. SSH service is enabled and used for shell logins only. UPS service is enabled and configured. After this I started putting the drives back in the machine, one by one, but rather than importing the old pools I'm re-creating each vdev/pool/dataset and copying data back to the NAS from a backup using straight cp and/or rsync (with --checksum to verify the copy). To date I have 9 of the original 12 drives re-installed. Last night I added scripts for automated snapshots to cron. That's all! No jails, SMB, or anything else...yet. @JoseMR, RAM was Memtested when new for a week. I retested last spring for 24 hours, updated BIOS at the same time. Memtest has never reported any errors at all on this system. If you think it's worthwhile to run some more I can do. I assume specifying vm.kmem is why memory usage seems to have stabilized. Most of the time memtest do very little on ECC RAM unless it is severely damaged or a bad memory controller present. Also noticed you have "48GB swap in a ZVOL on the SSD" this is way too much Swap, but the real problem is that is placed into ZFS, everything under ZFS uses RAM, so there is very little to no sense to run Swap from a zvol or a swapfile placed under a dataset. While this may or may not help, my recommend is to use a native swap partition, of say 2~4GB in size and re-try latest release, additionally if you are trying on Full Platform, please use RootOnZFS Platform which can be Firmware upgraded from WebGUI plus more features. the real problem is that is placed into ZFS, everything under ZFS uses RAM, so there is very little to no sense to run Swap from a zvol or a swapfile placed under a dataset. Has been a subject of flame fests since 2011. I don't think the issue is relevant any more with current FreeBSD version (see e.g. PR 199189). FWIW, Oracle/Solaris has been doing swap on a zvol for ages, in default install. Thanks for pointing out those informative links doktornotor, I think it will worth to make some simulations on spare hardware and see how it goes indeed. Just thought I should point out that the large swap partition was an attempted fix. The native swap partition is 1GB and it faulted using that, but since it was on a thumb drive I moved it to a big ZVOL, which made no noticeable difference. On the fresh install the ZVOL was deleted and only native swap partition was in use. Although still 48GB it was never used at any point. Final update. It took over a year of trial and error, but I finally found the problem. The memory consumption seems to have been a red herring, I noticed it was much better starting around Nov/Dec so possibly a update around that time solved that. Once I stopped focusing on fixing RAM consumption and looking at drive controllers, I did manage to get to the bottom of it all. The problem actually turned out to be the Spindown utility bundled with XigmaNAS which I used to spin down unused drives on the LSI controller. The Marvell controller worked simply because it was AHCI and drive spindown is set in the UI. In all fairness, I don't really know if it's software itself, the newest FreeBSD kernel not liking something it does, an interaction with newest LSI firmware/driver, or maybe that I'm using SATA drives. In anycase, using camcontrol timers in lieu of spindown still gives me spindown of unused drives and the system has been stable for over a month now. All I can say is "File it under things that make you go Hmmmm!" Like I said, I never figured out why it was causing trouble...as noted it might have been something else that didn't like what it was doing. I won't preclude that I might have been using it incorrectly as well, the documentation wasn't abundantly clear to me. All I can say for sure is once I stopped using it, problem gone. Turned it back on, crashes came back. If it works for you then I wouldn't change it.